Almost a week ago, my Introduction to Museology class had the opportunity to visit Banting House National Historic Site of Canada as part of our learning about museums with vision. As I mentioned in last week’s post on commemorative integrity, museums – like many other organizations – benefit from being guided by a concrete mission and vision. After working here for 5 months, a “museum on a mission” is just how I would describe Banting House. 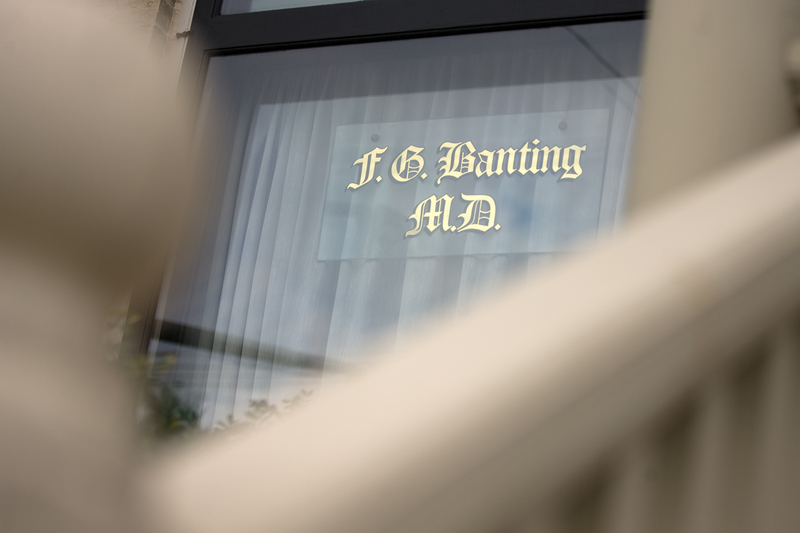 In a sentence, Banting House exists to create public awareness and understanding of the national historic significance of Sir Frederick Banting and preserve the commemorative integrity of Banting House, the birthplace of insulin, for the benefit of the people of Canada. The national significance of Banting is not necessarily shrouded in mystery. Most visitors who come to the museum know something about Banting. He’s often a subject of school projects, and his discovery of insulin is well known. However, historians like our curator, Grant, are around to remind us that there’s more to the tale. Our visitors are typically shocked to hear that he was also a decorated war hero and an enthusiastic artist. Banting flunked his first year of university before he switched into medicine. Furthermore, Banting knew very little about diabetes at the beginning of his medical career. He was not part of the research establishment when he conceived his hypothesis in London, and yet he became the first Canadian ever to win a Nobel prize. He was the only Canadian ever to get the Military Cross, a knighthood, and a Nobel. He was also the first Canadian on the cover of Time magazine. Even our M.A. and Ph.D. students in history had no idea Banting was so accomplished, or that he so often had to create success from failure. Without Banting House, this legacy would be lost. A significant material legacy would be lost as well, as the house is the only remaining structure associated with Banting in the early-1920s period. The encounter with this history becomes much more real for people when they can see objects he used, and step into the very room where his hypothesis for insulin was conceived. As I get the opportunity to see my classmates – or other tour groups – react to the message we tell at Banting House, I am reminded of why I decided to become a public historian. History matters. It teaches us, warns us, and motivates us. It helps us understand why the world is the way it is, what we can do to change it, and what makes us human. This is why museums with vision are so important. I hope that during your next visit to Banting House, Banting’s story will inspire you! Posted in Behind the Scenes at Banting House.Tagged Art, Artifacts, Banting, Collection, Diabetes, Documents, Exhibit, History, London, Museums, tours.